Solid Carbide Drill Bits For extremely Abrasive Materials. Solid Carbide Drill Bis For extremely Abrasive Materials. 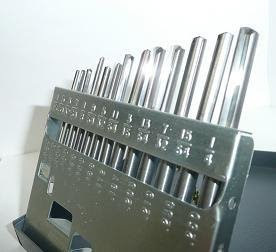 13 Piece Submicron Carbide HI-ROC CGDF Treated, 140 Degree Notched Drill Point. Used For drilling Super Hard abrasive applications. Such as Heat Treated Stainless, BORAN , Some Titaniums and heat treated steel alloys.